Three and a half billion years ago, Earth hosted life, but was it barely surviving, or thriving? A new study carried out by a multi-institutional team with leadership including the Earth-Life Science Institute (ELSI) of Tokyo Institute of Technology (Tokyo Tech) provides new answers to this question. Microbial metabolism is recorded in billions of years of sulfur isotope ratios that agree with this study's predictions, suggesting that life flourished in the ancient oceans. Using this data, scientists can more deeply link the geochemical record with cellular states and ecology. Scientists want to know how long life has existed on Earth. If it has been around for almost as long as the planet, this suggests it is easy for life to originate and should therefore be common in the universe. If it takes a long time to originate, this suggests there were very special conditions that had to occur. Dinosaurs, whose bones are presented in museums around the world, were preceded by billions of years by microbes. While microbes have left some physical evidence of their presence in the ancient geological record, they do not fossilize well, thus scientists use other methods for understanding whether life was present in the geological record. Presently, the oldest evidence of microbial life on Earth comes to us in the form of stable isotopes. The chemical elements charted on the periodic table are defined by the number of protons in their nuclei. For example, hydrogen atoms have one proton, helium atoms have two, carbon atoms contain six. In addition to protons, most atomic nuclei also contain neutrons, which are about as heavy as protons, but which don't bear an electric charge. Atoms that contain the same number of protons, but variable numbers of neutrons, are known as isotopes. While many isotopes are radioactive and thus decay into other elements, some do not undergo such reactions; these are known as "stable" isotopes. For example, the stable isotopes of carbon include carbon 12 (written as 12C for short, with 6 protons and 6 neutrons) and carbon 13 (13C, with 6 protons and 7 neutrons). All living things, including humans, "eat and excrete." That is to say, they take in food and expel waste. Microbes often eat simple compounds made available by the environment. For example, some are able to take in carbon dioxide (CO2) as a carbon source to build their own cells. Naturally occurring CO2 has a fairly constant ratio of 12C to 13C. However, 12CO2 is about 2 percent lighter than 13CO2, so 12CO2 molecules diffuse and react slightly faster, and thus the microbes themselves become "isotopically light," containing more 12C than 13C, and when they die and leave their remains in the fossil record, their stable isotopic signature remains, and is measurable. The isotopic composition, or "signature," of such processes can be very specific to the microbes that produce them. Besides carbon, there are other chemical elements essential for living things. For example, sulfur, with 16 protons, has three naturally abundant stable isotopes, 32S (with 16 neutrons), 33S (with 17 neutrons) and 34S (with 18 neutrons). 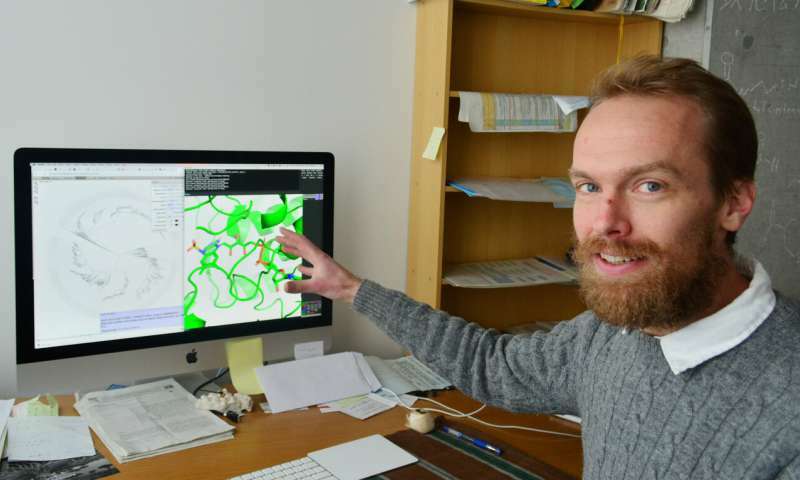 Sulfur isotope patterns left behind by microbes thus record the history of biological metabolism based on sulfur-containing compounds back to around 3.5 billion years ago. Hundreds of previous studies have examined wide variations in ancient and contemporary sulfur isotope ratios resulting from sulfate (a naturally occurring sulfur compound bonded to four oxygen atoms) metabolism. Many microbes are able to use sulfate as a fuel, and in the process excrete sulfide, another sulfur compound (Figure 1). 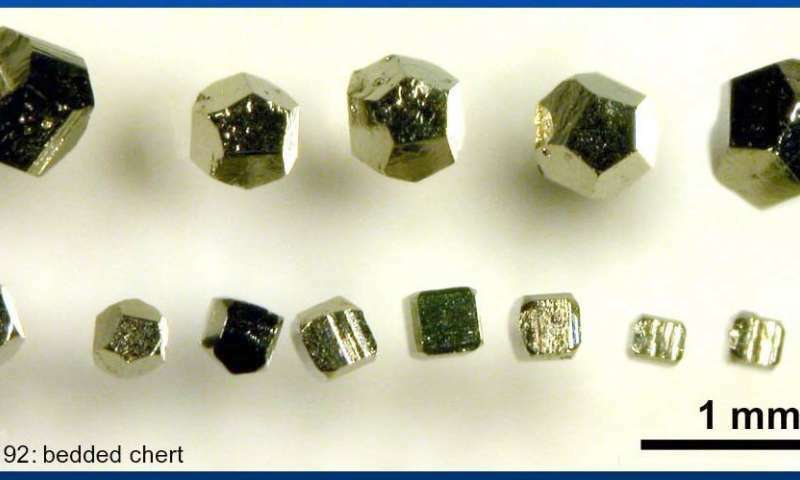 The sulfide "waste" of ancient microbial metabolism is then stored in the geological record, and its isotope ratios can be measured by analyzing minerals such as the FeS2 mineral pyrite shown in Figure 2. This new study reveals a primary biological control step in microbial sulfur metabolism, and clarifies which cellular states lead to which types of sulfur isotope fractionation. 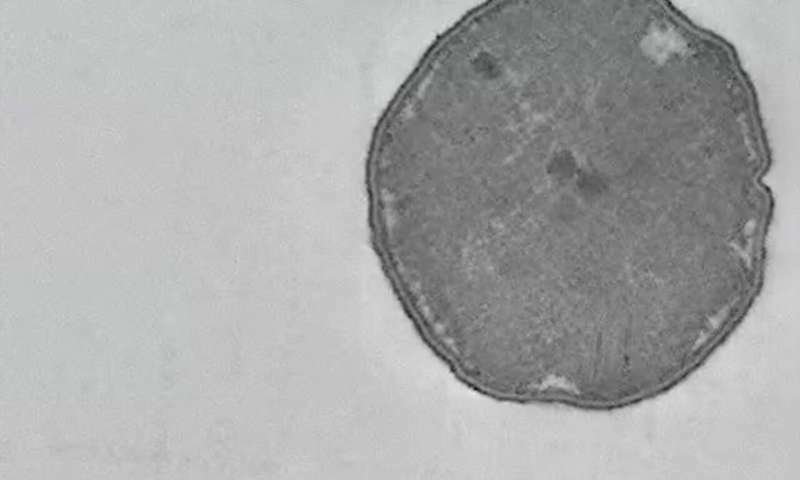 This allows scientists to link metabolism to isotopes: By knowing how metabolism changes stable isotope ratios, scientists can predict the isotopic signature organisms should leave behind. This study provides some of the first information regarding how robustly ancient life was metabolizing. Microbial sulfate metabolism is recorded in over 3 billion years of sulfur isotope ratios that are in line with this study's predictions, which suggest life was in fact thriving in the ancient oceans. This work opens up a new field of research, which ELSI Associate Professor Shawn McGlynn calls "evolutionary and isotopic enzymology." Using this type of data, scientists can now proceed to other elements, such as carbon and nitrogen, and more completely link the geochemical record with cellular states and ecology via an understanding of enzyme evolution and Earth history. jeebus, this is like the story about the group pf blind wisemen. Who tried to describe an elephant by feeling different body parts. Every damn week, a new study comes out claiming more exact results of post-hadean Earth. Now I see two problems with wuth my speculation. Every time one of these research projects moves to another county? They will get different results! The first problem is. that there were multiple chemical operations committing the sin of pre-biological organization. Triggering off multiple lines of evolution? That all coincidentally utilized the same chemistry & structure? Hundreds of millions similar slimes produced across hundreds of millions of years. & you thought the religious wooloons were crazy! "I'll see your crazy & raise you two lunacies!" The problem is that we run out of unaffected sediments at 3.5 Gyrs ago. But there are a lot of these tracer isotope ratios to go through, so maybe they can add some ages. Every ... a new study comes out claiming more exact results of post-hadean Earth. As expected from science, meaning it is criticizing and improving. We all note that you provide no useful alternative but are simply trolling. And while it is particularly unreadable (I am still waiting for funny trolls, instead of the boring, incomprehensible humdrum) it seems to suggest erroneous magic? @rrwilsj - Actually there is no indication that different geological sites give different results, with the proviso that there are not many 3.5 billion year old sites. If you have a suggestion of what kind of non-biotic reactions can reproduce biotic isotope ratios please volunteer them. As far as I know there are none. The fact is that the basic metabolic cycles for all types of microbes that utilize sulfate respiration to get energy are basically the same because they have to go through basically the same enzymatic cycles to reduce sulfate to sulfide, and thus produce the same isotopic ratios. You are not making knowledgeable or useful objections, nor are your arguments sound. Personally, I would find this study more convincing if we see non-biotic rations occuring at some point as an indication of a time before life, but they may not exist. Impossible. The universe was created by God 6,000 years ago, and these dishonest, communist, scientists are just lying so that they can steal the money from Real Tax Paying Americas AKA Republicans. Or so I'm told by Republicans. Oh torbjorn, stop! & parsec two. Between the pair of you? I blush for all all your praise. Well, if I ever remember how that blushing thingie works. Actually I appreciate both your comments & I am willing to concede that the both of you are probably more correct then my guestimates. However, 3.5+/- billion years ago? Sounds like a lot of untrod ground & undiscovered, unpredicted possibilities. Even improbabilities still to be found. I cannot prove if my speculations may or may not turn out sort of accurate. That's why the proximity fuses. But, I do enjoy speculating. You don't want to wind up being conflated with the stuffy, brain-dead woomongers or stuporstitious fakirs sluggards, now do you? Finally, I am not afraid to be wrong. Or be called out for being wrong. When I agree with the correction that I was in error. When you question the 3.5 Gyrs age I can tell that you did not look into the paper, as I did. They have data going back that far, and it is in accordance with fossils older than that. And of course the first serious integrations of all the available data get the credibility interval until life evolved to within 40 Myrs after the Moon forming impactor [ https://www.natur...8-0644-x ]. In the absence of hard constraints telling us it did not happen within that time frame there is no principle problem of expecting younger data than that. Seeing how I have done research but I suspect you have not, I can form my own informed opinion on what is fun (discoveries, say) and what is not (reading poorly written comments trolling science with personal incredulity as 'argument'). "If it has been around for almost as long as the planet, this suggests it is easy for life to originate and should therefore be common in the universe. "Wrong logic. From the fact that life was formed very early on Earth, it does not follow that it is widespread in the Universe. The earth was originally formed as a unique planet in a unique solar system. Wrong logic. From the fact that life was formed very early on Earth, it does not follow that it is widespread in the Universe. But it does indicate life PROBABLY forms as soon as conditions are right for it thus is PROBABLY widespread else seems like a strange coincidence that it started so early on Earth. The earth was originally formed as a unique planet in a unique solar system. In what way is Earth a more 'unique' planet than all those billions of other Earth-like planets in the universe that would mean life wouldn't also form on them? I agree that this Earth is unique. Obviously not for the same reasons you do. I think the need to categorize everything into neat little boxes of "just so & no other!" Is an endearing result of our monkey brains vainly attempting to simplify our observations. I am of the opinion that every star, every planet, every asteroid will turn out to have at least one unique feature we did not predict or even consider possible. As for the assumption there must have been a creator? That a "unique" Earth is a either an accidental result of hopelessly incompetent creation. That bungled the rest of the Planets. Or, the Earth is an overlooked oddity in a Universe created to be non-living. You really need to stop berating the deity, especially about what it's intentions were. That one is a mean drunk & worse when coming out of a hangover. Probably can't remember it's original intentions. Make up all the fairy tales you want but the reality is Reality is a Colossal Fail!